Hash House a Go Go is a small and growing chain that serves “twisted farm food” for breakfast, lunch and dinner. The restaurant is a colorful blend of bright colored walls and booths mixed with faux steel table tops as well as wall accents. The LOUD and bustling restaurant does not take reservations but if you swing by at an odd time you might luck out and avoid the normally long wait time. We stopped in on a Sunday afternoon a little after 1PM and only had to wait about 15-20 minutes to get a table. For my entrée I opted for the much talked about Andy’s Sage Fried Chicken & Waffles ($15.95) which is served with a maple reduction syrup. This heart clogging, stomach busting behemoth will throw you into a diabetic coma if you’re not careful. Two huge pieces of sage fried chicken sit on top of four huge waffles that are each stuffed with fried bacon, as if the fried chicken and waffles themselves weren’t enough to send you running to your cardiologist. I found the chicken on top to be of good flavor and quite moist on the inside. The waffles underneath were very tasty, especially when drizzled with a little extra of the diet killing syrup. This dish is recommended if you think you’re big enough to handle it. I made it through maybe half before throwing in the towel. Service was very friendly from the hostess to the bartender to the waitress. It was a pretty good pace albeit a bit on the fast side; what I would consider to be normal for a quick meal style of restaurant. Hash House is open daily for breakfast and lunch from 7:30AM until 2:30PM; dinner Monday through Thursday from 5:30PM until 9:00PM. Dinner is served and extra hour on Friday and Saturday nights until 10:00PM. They are closed on Sunday evenings. Attire is casual. Parking is free in the adjoining lot. Major credit cards are accepted. 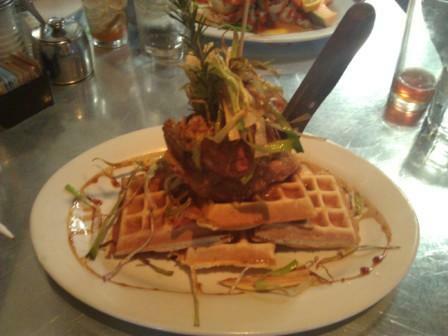 Hash House a Go Go: recommended for a quick, filling meal.